Face it, Private... -_-. Oh, Private... You're so cute when you're totally innocent X3. HD Wallpaper and background images in the पेंग्विन्स ऑफ मॅडगास्कर club tagged: penguins of madagascar kowalski private. Aww. Now poor, Private has to know the horrible truth. 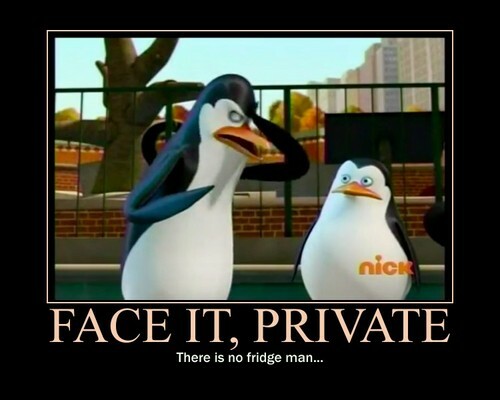 Wouldn't it just be hilarious if Private caught that Fridge-Man one day, and showed it to Kowalski? I bet he'd even say, 'I told you so,' and Kowalski would just FREAK OUT! If this was the big bang theory, Kowalski = Sheldon Cooper, Rico = Raj Koothrapoly, Skipper = Lenord Hoffsteder, Private = Howard Wolowitz, and Marlen = Penny.